Looking for great apps at a fraction of their regular price? We’ve found 128 iPhone and iPad apps that are currently on sale. 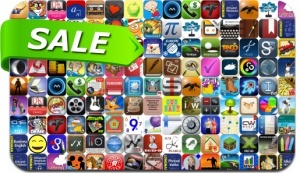 This app deal alert includes Envelope, Perfect Slice, Hyperlight, Reiner Knizia's City of Secrets Skyline, Black Water, Midnight, iChalk Mobile, MoviePro, Dailybook, Taskify, GlitchMachine, CurrencyGo, ExpenSense, Outside, eBuddy and many others.